On Sunday, April 14, 2013, the CTA moved the two Cincinnati Antique Cars, 4271-4272, from Linden Shop to Skokie Shops, taking the long, long way via the Loop L. The move was almost completely un-publicized except for a select group, mainly employees and former employees that had a direct involvement in the servicing and operation of the historical cars over the years. The cars carried a special signboard marking their 90th anniversary. 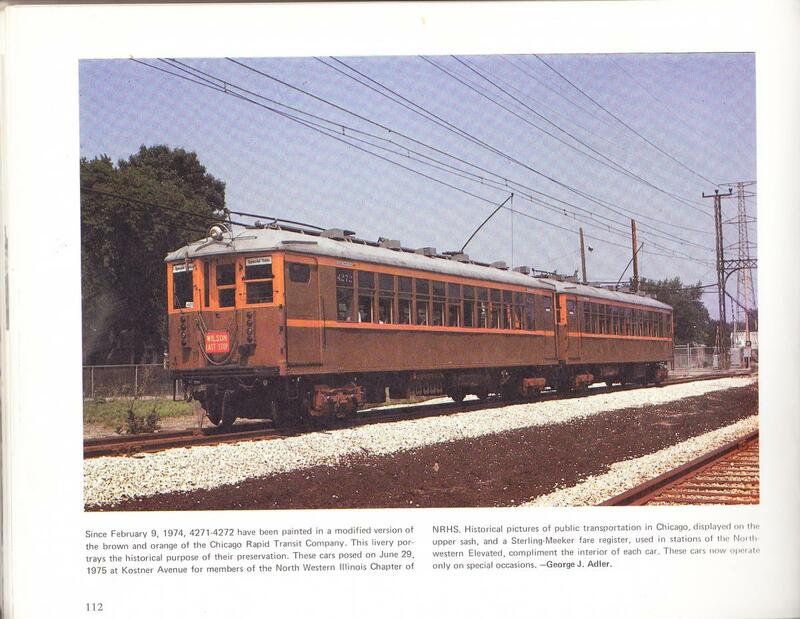 The Cincinnati cars are so-named because they were built by the Cincinnati Car Company. They were built in two large groups: 4001-4250 built in 1914-1915 and 4251-4455 in 1922-1924. The first group had "bald" roofs, many early ones had "bowling alley seating". The second group had trolley poles, plush seats. Both groups were nicknamed "the four-thousands". 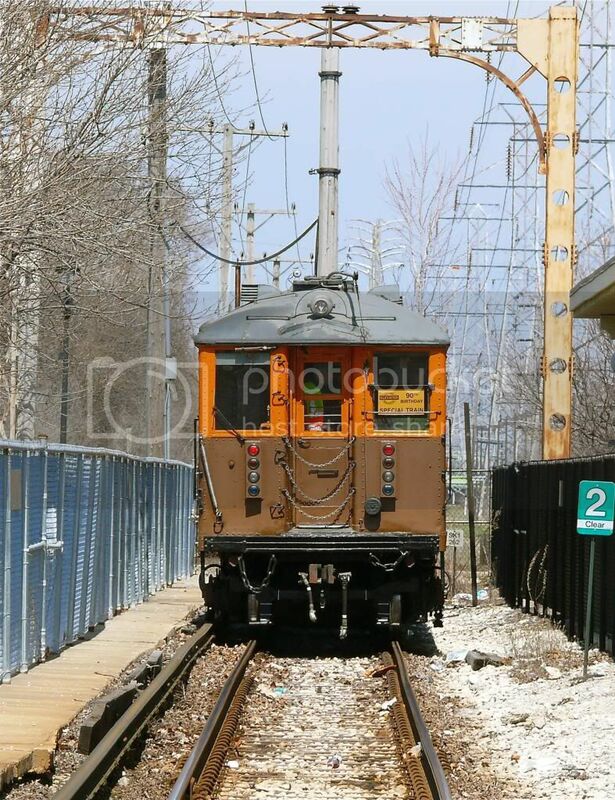 The trolley pole cars were last used on the Evanston Express in the 70s. 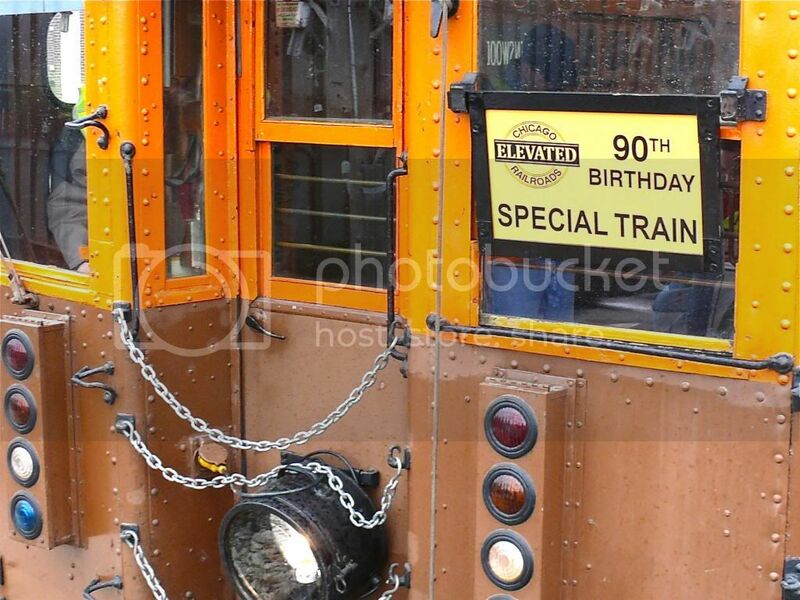 Close-up of special 90th anniversary sign board at photo stop at Wilson station. 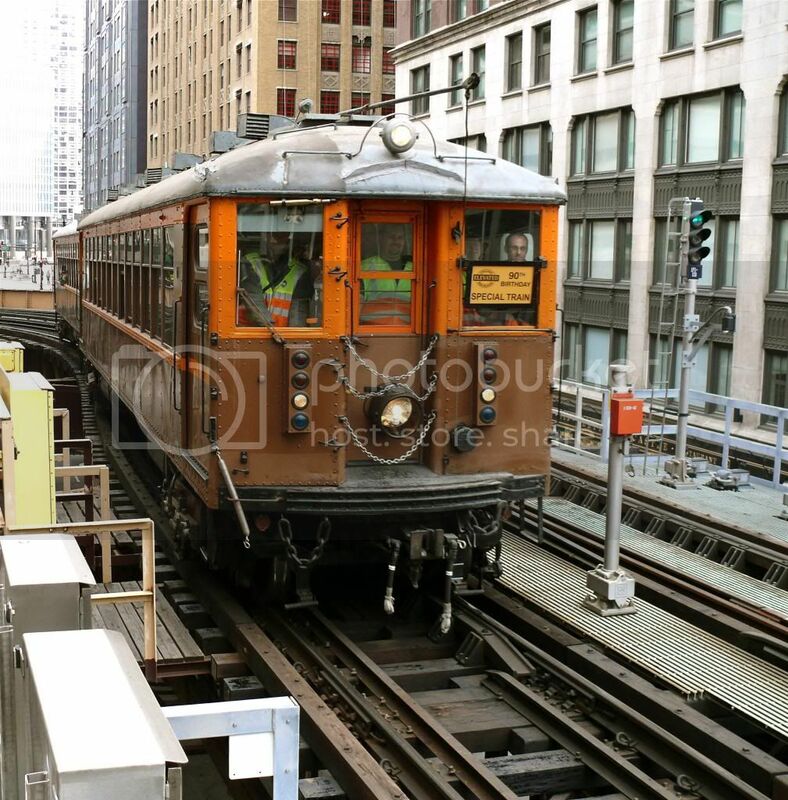 Antique Train comes off 90 ft curve at Lake and Wabash and spproaches Randolph station. Antique Train prepares for the "reverse move" setting up a photo runby at Sheridan station on the north side main. A head-on shot from the pedestrian crossing at Dempster-Skokie. The Antique Train has pulled all the way down to the bumping post to clear the turn-back track for regular Yellow line trains. The structure overhead is a part of the original catenary support dating back to the days when these tracks were the high-speed Skokie cut-off for the North Shore electric interurban railroad. Most passengers were amazed and astonished when the Antique Train would go past. Few knew what they were seeing. I guess I am not special enough? I'll remember this snub. What was the reason for the move? and how'd you get the photos of it in action from the platforms? Are these cars going to IRM? Thanks for the neat pics! My wife and I got to ride the ones at IRM. This trip had to be a real joy! BTW, I hope those small brown spots at the end of that car is just dirt or surface rust and not something more serious. The CTA has taken no steps to remove these cars from its roster. 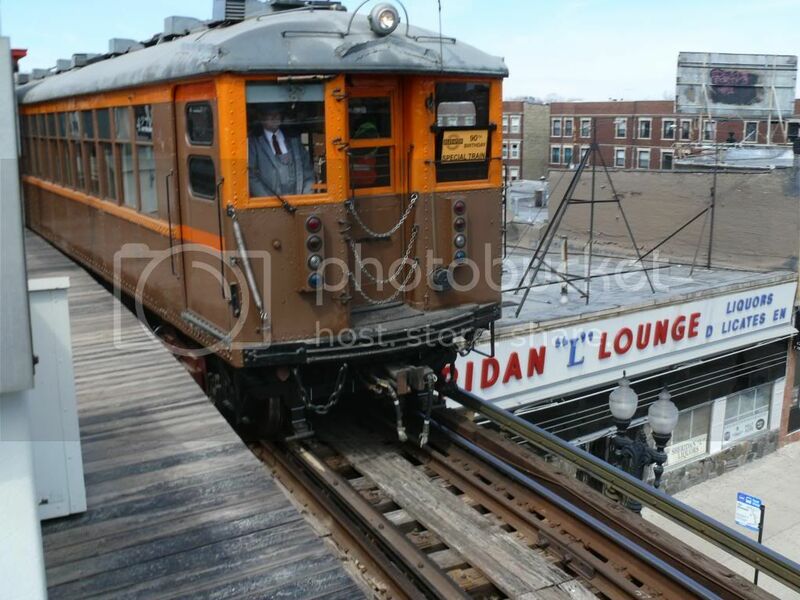 The cars were stored at Linden Shops and were moved to make room for servicing Red line trains when the 98th St. shop is closed for five months. There are several high level people at CTA who probably want the CTA to keep these cars. So they're safe for now. In a year or two, no one knows. 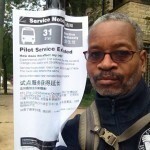 What is so special about these cars that some folks at the CTA want to keep them. The CTA has not kept any other models when they were retired? David ... I have to ask a question that you may or may not know the answer to ... but if you can give it your best shot I would greatly appreciate it. On the front of the car, the motorman's side is bumped out slightly and appears to be angled, resulting in a small, narrow rectangular window that is in the bump out. In your best guess, with hopefully being up close and personal with the cars, can you guess/approximate as to how far that bump out sticks out in feet or inches? The reason I ask is that I am attempting to create a 3D model of the front to be used in scratchbuilding a set of cars that will fit on a MTH 6000 3 rail chassis. I have the CERA rolling stock book and some other plans, but its hard to determine how far that sticks out. I know I need to travel out to IRM and do some on-site measuring, but I'm not sure when I'll be able to make it out there. My current mode, which was just a test run to see if I could figure out the 3D program, has the angle of the motorman's cab too steep and the window on the door in the wrong place (plus I didn't put any details on it). The anti-climber is also too wide. This is my first attempt at 3D modeling, so its a little rough. Since these will go on a MTH 6000 3 rail chassis, its not going to be 100% scale accurate. But, I'd like to try to get the proportions correct so it will at least look correct. 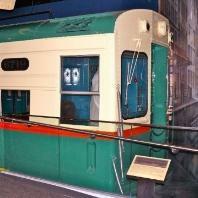 Did CTA use that "North Shore" type headlight on the front door in revenue service? A trip out to IRM is definitely in order. Plus, your close up pictures of the front end really help. Hopefully I can pull this off and have some 4000's to run on the layout. Once I finish the detailed front end and see if it can print I'll report back. The cars were out on public view on the 100th anniversary of a station being at Linden. We can make our own inferences about what was happening on April 14. I Saw 4271 and 4272 traveling south over the Wells street bridge today around Noon from my office. I didn't see them head back North or West on Lake, so maybe they went South through the Tower 12 junction? I'll post a response to you. The Cincinnati Cars are conducting guests of the CTA. The cars are stored awaiting the guests return. After the guests are taken back the cars will run lite to Skokie. Get your pictures. Small trivia - 4271 was involved in the Granville wreck - next to last car. The trailer's roof ended up on top of 4271, it's trucks under 4271's platform. So one end is probably at least partially a rebuild.